Upon return from my sister's house, I put down "Secret Ingredients" and read through a few magazines that had piled up. I also read a few more chapters of "The Brief Wondrous Life of Oscar Wao" but find I'm not drawn to it to finish. I probably will, but I'm in no rush. I read a few long articles that I had printed out. One was called Unhappy Meals by Michael Pollan and was in the NY Times a year ago. Fascinating read about food and nutrition and "nutritionism". It came out a year ago but is really good information. The guy who wrote the article wrote "The Omnivore's Dilemma" and more recently "In Defense of Food." The article is about how we have come to pay more attention to nutrients than food and how that turns out to be not so good for us. Then I read How America Lost the War on Drugs by Ben Wallace-Wells in Rolling Stone. I had heard him NPR's Talk of the Nation and it's amazing how stupid our government can be. Not that this is a big surprise, but still. 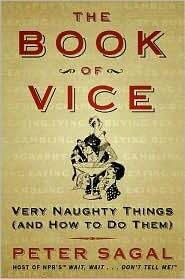 Sarah loaned me the book "The Book of Vice" by Peter Sagal. Mr. Sagal is the host of Wait Wait... Don't Tell Me! (also on NPR) and you will find me laughing my head off while on my morning walks, listening to this as a podcast. Wow I love that show. This book is a lot of fun and really gives you some insight into things you might not ever have wanted to actually find out about on your own or even ask someone else. Peter is the Everyman (and with his wife, the Everycouple) that stands in for our own curiosity. Thanks for the loan, Sarah!